Rugged, Durable Enlarger for 4x5"
The Beseler 45MXT is the latest in a series of 45M enlargers that Beseler has been manufacturing and continuously improving for more than half a century. The triangular truss reinforced, twin-girder frame provides a rock-steady foundation for this classic enlarging system, enabling it to produce tack-sharp prints from 35mm film larger than 16 x 20" on the baseboard (+ 17.5 x 22"), up to 25.5 x 38.5" on an Adjus-Table and even larger images via wall projection. A neoprene light seal in the upper negative stage virtually eliminate stray light leakage in the darkroom. From the onset, the 45MXT has always been a modular system, so virtually every component and accessory that fits the current enlarger will also fit every 45M enlarger manufactured since 1953. Thus the long term retained value of every Beseler 45M enlarger is enhanced by its non-obsolescence design. Maximum Film Size Up to 4 x 5"
Baseboard Size Laminated 20.3 x 25.5"
Specialties Sturdy heavy gauge steel enlarging table for the 45M series. Drop-top design permits the standard MXT baseboard (No.8232) to be lowered into a series of slots within the frame of the Adjus-Table. The lower the baseboard, the greater the magnification, up to 30x with 50mm lens and up to 11x with 150mm lens. Maximum full frame print size is 24 x36". 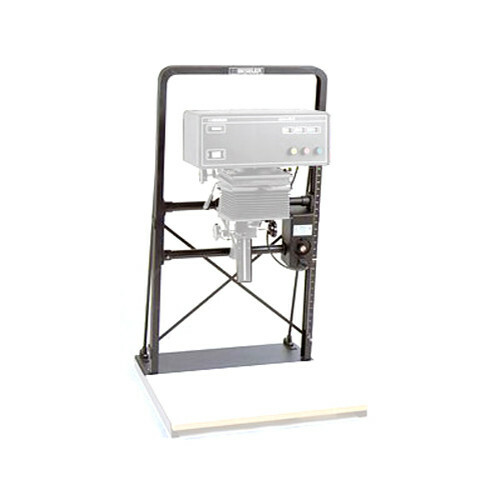 In addition, Wall Mount Kit (No.8239), attaches 45MXT chassis to wall for extra rigidity with the baseboard, for extra large printing, or over table for applications where a baseboard isn't required. Also includes upper chassis support bracket to secure to wall for maximum system rigidity. Requires user installation. Most 50mm lenses can be mounted on (No.8021) lensboards. Most 75-80-90-105mm lenses can be mounted on (No.8023) lensboards. Most 135-150mm lenses can be mounted on (No.8029) lensboards. Most 150mm lenses with 50mm rear thread size can be mounted on (No.8037) lensboards. Other lensboards are available to accomodate virtually every lens. Most 35-150mm lenses with 39mm rear thread size screw directly into the Turret without an adapter. Lens adapters are available for other lenses. NOTE: If in doubt about mounting a specific lens onto the Turret, please call store to learn which lens adapter is required, if any. Accessories Wall/Table Mount (No.8239), Adjust-Table (No.8540), Wall Projection Bracket (No.8128), Lens Stage Conversion Kit (No.8226) (for older 45 series enlargers prior to MXT to accept 3 lens turret. Offers improved alignment and adjustable below the lens filter holder. Takes 4 x 4" lensboards), Bilateral Alignment Tool (No.8139).